Brock Peterson (2) receives praise from teammates after scoring game two's game-winning run. 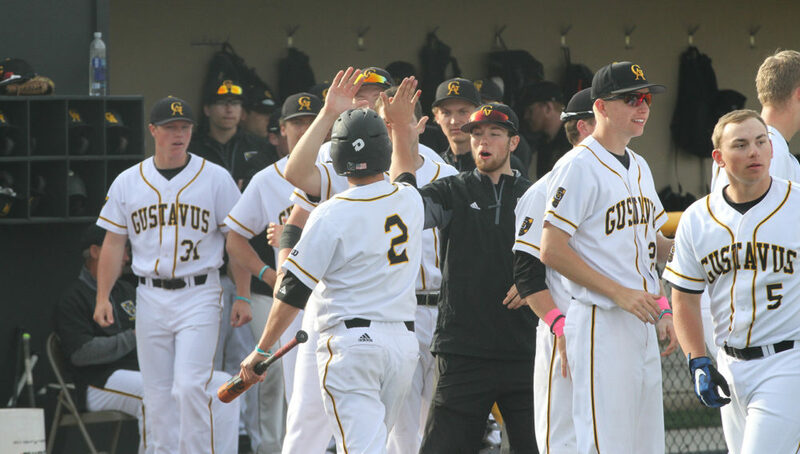 ST. PETER, Minn. – The Gustavus baseball team earned its second Minnesota Intercollegiate Athletic Conference sweep in as many days, taking 3-0 and 4-3 wins versus Hamline University during the final home game of the season at Gustie Baseball Field Wednesday afternoon. Solid pitching in game one and game two’s timely hitting kept the Black and Gold (16-15 overall, 8-8 MIAC) playoff hopes alive. The Gusties took advantage of Hamline mistakes in game one, scoring three unearned runs off of Piper errors. Brice Panning (So., Hamburg, Minn.) earned the win on the mound, tossing 6.2 scoreless innings while tallying five strikeouts and giving up just four hits. In the third inning, a ground ball from Carter Clemensen (Fy., Cologne, Minn.) snuck past Hamline’s shortstop while Ryan Moriarty (Jr., Le Sueur, Minn.) was rounding third base to score the eventual game-winning run. Gustavus then added a pair of runs in the sixth to claim a three-run cushion. After a Moriarty leadoff base on balls and a Clemensen single, an errant throw from the Piper pitcher advanced the Gusties to second and third base. After an intentional walk to Cole Pengilly (Fy., Le Sueur, Minn.) to load the bases, Matt Berkner (Jr., Sleepy Eye, Minn.) reached on a fielder’s choice, knocking in Moriarty. Dexter Leer (Jr., Owatonna, Minn.), who pinch ran for Clemensen, then gave the Gusties a 3-0 lead as he scored on another errant throw. With two outs in the seventh, Adam Stockwell (Jr., Apple Valley, Minn.) came in to relieve Panning as he allowed a pair of two-out baserunners. A groundout to Pengilly then sealed the win while Stockwell picked up his first career save. With the game tied 3-3 in the sixth inning, a Moriarty RBI single scored Brock Peterson (Sr., Cannon Falls, Minn.) for the game-winning run. The Pipers scored their first run of the day in the second off a solo homer, but the home team came back with two runs in the bottom half. A RBI single from John Lundquist (Sr., Rochester, Minn.) and a run from a Hamline error gave Gustavus a 2-1 lead. Hamline gained its first lead of the series with a pair of runs in the fourth and fifth innings, knocking Gustie starting pitcher Sam Archer (Jr., Zimmerman, Minn.) out of the game. The Gusties answered production from Hamline right away, again. In the bottom half of the fifth, a RBI single from Pengilly scored Leer, tying the game at 3-3. A leadoff single from Peterson in the sixth set up the game-winning RBI single from Moriarty as the scoreboard read 4-3 Gusties. Stockwell pitched the final three innings of the game during his second relief appearance of the day, earning his first win of the season while limiting the Pipers to just one hit. Moriarty (2-4, 1 RBI), Nolan Lepel (Sr., Plato, Minn.) (2-4), Pengilly (2-3, 1 2B, 1 RBI), and Peterson (2-3, 2 R) paced Gustavus at the plate. On Saturday, the Gusties are set to head to the University of St. Thomas. Game one is scheduled for a 2:30 p.m. start from St. Paul, Minn.